On July 30, 1892, Professor Blondie Willies was scheduled to give a balloon exhibition in Worcester. As preparations for the ascent were being made, volunteers held the balloon earthbound with anchor ropes. Then a sudden thunderstorm blew in, and heavy winds and rain buffeted the balloon, causing it to get away from the men who were attempting to hold it down. As the balloon began to rise, one man, identified as Benjamin Long, got his right foot caught in the loop at the end of the rope he was holding and was yanked off his feet and pulled upwards. Five thousand people had gathered to watch the ascension, and those who hadn’t sought shelter watched in horror as Long was seen dangling by his leg as the empty and untethered balloon continued to rise and thunder and lightning raged all around. 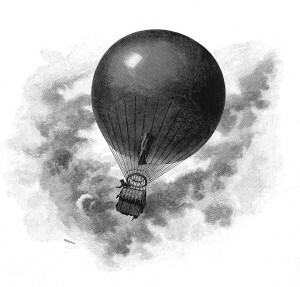 Long did the only thing he could do under the circumstances, and that was to begin maneuvering in such a way as to be able to grab hold of the parachute suspended beneath the balloon and pull the cut-off rope. He fell for fifty feet before the chute deployed, however the wind carried him over a nearby lake where he landed in the water. After swimming ashore on his own, he was greeted to cheers and applause by those who had witnessed the incident. None was more relieved to see Long safe than his mother, who had accompanied him to the event.